President Trump's threats of increased sanctions add yet another headwind to Turkey's struggling economy. Turkey's economy is in dire straits, and President Donald Trump's threats of increased tariffs aren't helping. 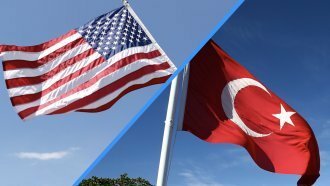 Turkey is one of many countries already facing tariffs on steel and aluminum exports to the U.S., of 25 percent and 10 percent respectively. But Trump tweeted Friday he planned to double those tariffs against Turkey to 50 percent and 20 percent. The steel industry will likely feel the brunt of those tariffs: 10.7 percent of all U.S. steel imports came from Turkey in 2017. The country has been shipping less steel to the U.S. since the tariffs took effect. Turkey's economy is already struggling: Its currency, the lira, dropped more than 40 percent in value from where it was this time last year. But Turkey's currency troubles could actually take some of the sting out of U.S. sanctions. Cheaper currency effectively lowers the price on steel, undermining the whole point of the tariffs. And right now, Trump probably wants tariffs on Turkey to bite. The two countries are feuding on a number of issues, most recently the fate of a U.S. pastor arrested in Turkey on suspicion of being involved in a coup attempt. Turkish President Recep Tayyip Erdogan doesn't appear to be backing down. In a recent speech, he railed against attacks from "economic hitmen" and called on Turkish citizens to trade in their foreign currency and gold for lira. Trump's decision to tighten the screws on Turkey could also send a warning shot to other countries with relatively weaker currencies. Trump has singled out China in particular for allegedly trying to make its exports more attractive by toying with its currency value.